• Developers scaled back housing starts by 25% in the first quarter, the biggest reduction ever, according to Nomura. • Land sales fell by 20%, eating into government income. The Chinese state depends on land sales and property taxes to fund 39% of total revenues. • Each attempt to rein in China’s $25 trillion credit bubble seems to trigger wider tremors, and soon has to be reversed. • Wei Yao, from Société Générale, said the property sector makes up 20% of China’s economy directly, but the broader nexus is much larger. Financial links includes $2.5 trillion of bank mortgages and direct lending to developers; a further $1 trillion of shadow bank credit to builders; $2.3 trillion of corporate and local government borrowing “collateralised” on real estate or revenues from land use. “The aggregate exposure of China’s financial system to the property market is as much as 80% of GDP”. • The risk is that several cities will face a controlled crash along the lines of Wenzhou, where prices have been falling non-stop for two years and have dropped 20%. • The IMF says China is running a fiscal deficit of 10% of GDP once the land sales and taxes are stripped out. Zhiwei Zhang, from Nomura, said the latest loosening measures are not enough to stop the property slide, predicting two cuts in the reserve requirement ratio (RRR) for banks over the next two quarters. He warned that any such move will merely store up further problems. • … the all-important real estate market saw sales fall 7.8% in renminbi terms in the first four months from the same period a year earlier. • … in the first four months newly started construction projects fell 22.1% compared with a year earlier, according to government figures released on Tuesday. 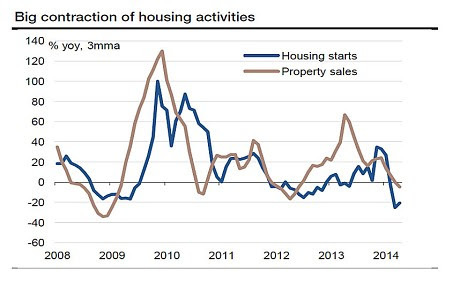 Here is what China reported overnight via SocGen: New starts contracted 15% yoy (vs. -21.9% yoy in March); property sales fell 14.3% yoy (vs. -7.5% yoy); and land sales (by area) plunged 20.5% yoy (vs. -16.9% yoy previously). • Chinese property is the most important sector in the global economy. It has been pivotal in the country’s economic development, provided lucrative business for industrial commodity producers from Perth to Peru, and been the backbone of the surge in world exports to China. • At best, China is entering a deflationary phase at a time of global fragility. • Property investment has grown to account for about 13% of GDP, roughly double the US share at the height of the bubble in 2007. Add related sectors, such as steel, cement and other construction materials, and the figure is closer to 16%. • Inventories of unsold homes in Beijing are reported to have risen from seven to 12 months’ supply in the year to April. But when it comes to homes under construction and total sales, the bulk is in “tier two” cities, where the overhang of unsold homes has risen to about 15 months; and in tier three and four cities, where it is about 24 months. Chinese property is the most important sector in the global economy. That’s quite a statement, and disputable – what about oil, or guns -, but there’s no doubt it’s big. Lots of countries will risk a recession of their own if a large part of exports to China, think wood, iron ore, aluminum, falls away. China’s been many a small country’s sugar daddy in the past two decades. That’s true too of course for the US and EU. And don’t let’s forget that China’s exports have fallen sharply as well so far this year. Or that Beijing has already blown a $25 trillion credit air balloon in just the past few years, and the shadow banks blew their own bubble straight on top of that. Nice on the way up, but nothing goes up forever. And things that are leveraged to the hilt, as in the entire Chinese economy, tend to fall of that hilt at a very rapid clip. I’ve said it before, it might be a good idea for Washington to check into the origins of the Chinese “money” that buys up real estate and companies and entire African nations, but they’ll do no such thing because that would expose their own bubblicious balloons. I mean, when’s the last time you heard any US politician talk about China as a currency manipulator, and why do you think that is? So we, Jack and Jill Blow, will remain stuck where we are, forced to watch puppeteers and balloon traders buy up anything they want anywhere they want with credit conjured up out of a hatful of keystrokes, while we must work for every penny, if we’re even lucky enough to find a job that pays us pennies. It’s the price to pay for living in an artificial world. I think it would be a big mistake to presume that a severe recession in China wouldn’t drag us down with it. And going through these numbers, which are just the latest batch in a long series – though the year is still young – that I’ve written about here, it gets harder by the day to see how China could possibly avoid such a recession. The Chinese economy has been set up to move like a huge ocean liner does: full speed ahead and steady as she goes, but that combined with the size means you got a ship loaded with inertia, which takes miles to change course, brake, reverse, do anything other than move straight ahead. The Chinese leadership doesn’t have the tools to adapt to sudden and severe changes. But so far everyone seems to think they do. They themselves first of all. If you’ve made it to the top of what is supposed to provide absolute power over 1.3 billion people, you get to feel invincible, and you feel sure that being captain of a ship, no matter what size, is not an issue, even if you’ve never done it or trained for it. And they haven’t. They overestimate themselves, and their advisors, they have thought it would be like it is in the US, that all they had to do was model Washington and Wall Street, and it would be smooth sailing from there. They’re about to find out – they already are – that things don’t work that way, and so are we. An economy that in just two years uses the same amount of cement that the US used in the entire 20th century is not healthy, it’s dangerously bloated, and it can burst into smithereens at any moment.